I've been wanted to try out a new pizza dough recipe for a while. I love my old one, but wanted to try out something new. Last week, I finally did. This recipe is a bit thicker than my other recipe. We like thin crust pizza, but this was a good change and it was liked by all. I was talking to a friend last week about pizza dough and I realized that we don't even realize we're eating whole wheat pizza dough. I've only been using whole wheat dough for years now and we all love it. It makes me feel a little bit better about pizza, ha! I think you'll like this pizza crust, give it at try. It is very thick when you're kneading it, my kitchen aid mixer wanted to give up on me, but it made it through it. 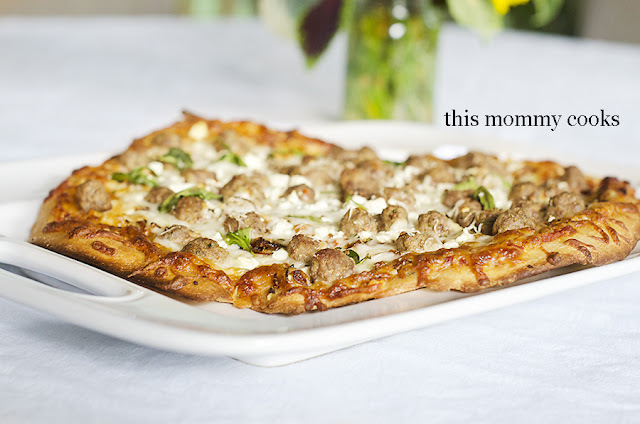 Tomorrow I'll share the recipe for the pizza in the picture below, it was so good!! In the bowl of a stand mixer, combine the water, oil, honey, and salt. Mix until well blended. Next, add half of the flour. Mix until just blended. Add the yeast, mix again until just combined. Add remaining flour and mix until just blended. Let it rest for 10 minutes. Knead for 6 minutes more using dough hook. (This can be done by hand if you don't have a mixer.) Once the dough has finished kneading, divide it into 2 or 3 dough balls. It makes enough for 2 thick crust pizzas or 3 thinner crust pizzas. This dough also freezes well. To bake the pizza, roll out the dough, add sauce, cheese, and other toppings, and bake for 10-15 minutes in an oven preheated to 425 degrees F.